Screening screens: why you don’t want to buy a Cinema Display (edited). With getting a new Mac Pro, I was skimming the market for a good, affordable TFT screen that had some decent specs for designing. The most obvious choice that I see a lot with Mac Pro’s is the Apple Cinema Display, of course, the most iconic display Apple’s made to date. It’s also perhaps the least updated Apple product in the last 5 years, with only a few price drops in recent years. I thought it would be nice to share my process of finding my perfect monitor; make a little comparison of the specs of all sorts of displays that would fit into my price range, regardless of brand or appearance, and draw my conclusions. My requirements are very simple; I’m not going to get a screen over € 700,-, it should be able to be reasonably good in delivering a full color gamut (high contrast and gamut), it has to be a TFT (LCD) screen, and it would be nice if it doesn’t look awful. Edit: It’s wise to read the comments of this entry to get a balanced view of things. I am no expert on LCD panel types, and for a the type of panel the Cinema Display carries, it’s a very affordable display. MDR 04 discusses interface design. Although already out for a solid four days, I just got around to listening to the lastest episode of the Mac Developer Roundtable, in which Scotty, Andy Matuschak, Dave Symonds, Dave Nanian, Rich Siegel and Marcus Zarra discuss interfaces and interface design. Some interesting related experiences and opinions are also thrown over the table. A listening recommendation for any developer. Grab it here, or subscribe to iTunes while you’re at it. 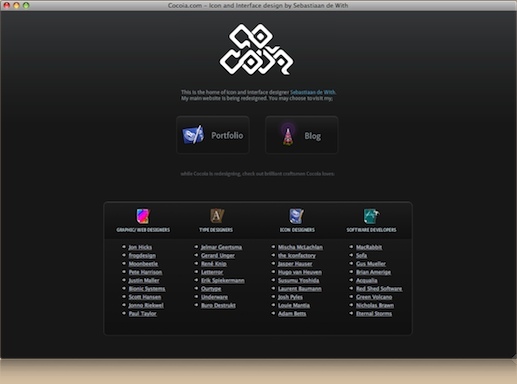 In its place will be this teaser page, until the new, dynamic combination of Icon Designer and Cocoia will be opened. I will assure you, it will finally be a logical place where you can easily find a lot of downloads and resources to download. The release be accompanied by the release of my Forgotten Mainframe and Orion Extended set – and oh, some extra’s. Check out the new design and my favorite internet places on Cocoia.com – and I’ll see you all when the new site goes live! Fortunately, not the Mac kind, but these prints for a security company by digital artist Alex Dragulescu are interesting generated visualisations of software that wreaks havoc on Windows systems. The Origin of the Inimitable Icons. I got some astonishing material in my hands today. It’s Apple’s material, and it is quite old – but I can assure you that the images are no less revealing and eye-opening. What I can’t figure out, for the life of me, is why Apple did not include this in the latest incarnation of their Human Interface Guidelines, as it is probably the best insight into the design of Aqua icons ever. Get a glimpse of the inception of Aqua inside. I was contacted by Acqualia – the creators of the Apple Design Award-winning application Picturesque – to design a new icon. Picturesque, an application I already use on my blog, is stunningly simple in its purpose and product; it beautifies images, but not in the typical Core Image-filter like fashion you see most of the time. The true power is the simplicity; there’s no ugly distorting filters to get in your way, but a few tools catered to your needs which provide instant satisfaction. Read on for the inside process in this ‘Making the Icon’ post.